We are ECI Agency, Inc., specializing in Oklahoma City insurance including home, auto, liability, motorcycle, life & health, business & commercial and workers compensation insurance in Oklahoma City, Edmond, Yukon and Piedmont and surrounding areas in Oklahoma. You probably have a standard home owner’s insurance policy. But, are you covered if the unthinkable happens? Can you afford to repair or rebuild you home if it is damaged or destroyed by an earthquake? Could you afford temporary housing if an earthquake rendered your home uninhabitable? Is your home insurable if you are experiencing frequent tremors now? Is earthquake insurance available if your home already has minor earthquake damage? Will the policy cover personal items damaged or destroyed inside your home? Are swimming pools and outdoor buildings included in the coverage? How much will it cost to add earthquake insurance to an existing home coverage? Earthquake insurance is available. Call us today at 405-373-2977 for a quick quote and answers to all your questions. Learn more here. Many of the public and product liability risks are often covered together under a general liability policy. These risks may include bodily injury or property damage caused by direct or indirect actions of the insured. In the United States, general liability insurance coverage most often appears in the Commercial General Liability policies obtained by businesses. You will need to buy a commercial auto insurance policy depending on the kind of driving you do. Homeowners insurance protects you from financial losses caused by storms, fire, theft, and other events outlined in your policy. Carrying the right amount of coverage is essential to protecting your family and belongings. Standard homeowners policies provide coverage for disasters such as damage due to fire, lightning, hail, explosions, and even theft. Remember they do not cover floods, earthquakes, or damage caused by lack of routine maintenance. There are many kinds of life insurance, but they generally fall into two categories: term insurance and permanent insurance. It's impossible to say which type of life insurance is better because the kind of coverage that's right for you depends on your unique circumstances and financial goals. But remember, the best way to figure out the amount and type of life insurance that makes sense for your particular situation is to meet with a qualified life insurance professional. Our individual and family health insurance plans are specifically designed to help protect you and your loved ones from today’s high health care costs. Cover yourself or your family with any of our plans. We can help you pick the best disability, long term care or dental insurance plan that fits your needs. We write with many health insurance companies include BlueCross BlueShield of Oklahoma. You can get quotes from many well known reliable auto insurance companies and choose the best policy with the right coverages for your needs at the cheapest price. Many of our customers have saved tons of money on their auto insurance. We provide excellent after-sales services as well. After you purchase your policy, you can use our website to make changes to your policy and report claims. Visit our auto insurance page to see why you need home insurance and questions to ask your agent before purchasing. We have a deep understanding of a church’s unique protection needs, with a 24-hour claims hotline and specially trained on-staff claims adjusters. We provide insurance coverages tailored to your church. We are experts in our field with superior claims service. Get a church insurance quote now. Total Event Insurance presents an integrated online system to provide you with the most convenient and effective method of quoting specialty insurance available. Products include Event Cancellation, Special Event Liability, Weather Insurance, Prize Indemnity and Wedding Insurance. We are dedicated to providing the best service for our customers. In pursuit of this goal, we are part of the Bainswest partnership. 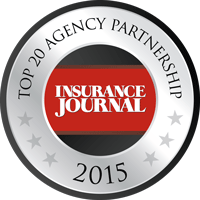 Our partnership has been featured on Insurance Journal as one of the top 20 agency partnerships a second year in a row.